TL;DR: A hacker uploaded a fake JPG file containing PHP code that generated “invisible” spam blog posts on our website. To avoid this happening to you, block inactive accounts in Drupal and monitor Google Search Console reports. 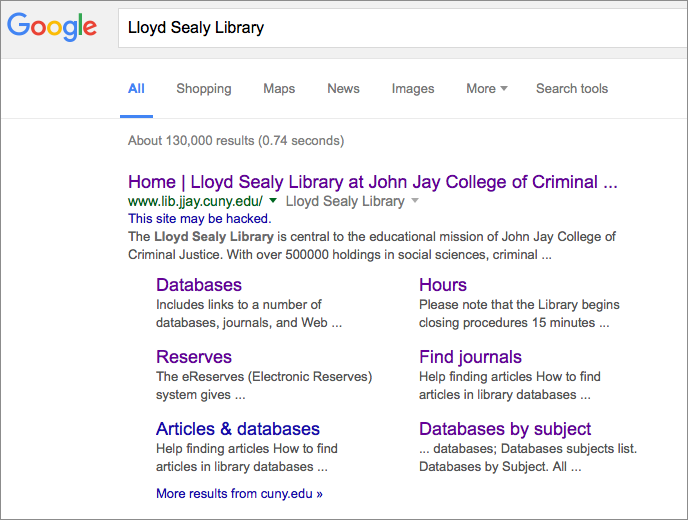 I noticed something odd on the library website the other day: a search of our site displayed a ton of spam in the Google Custom Search Engine (CSE) results. But when I clicked on the links for those supposed blog posts, I’d get a 404 Page Not Found error. 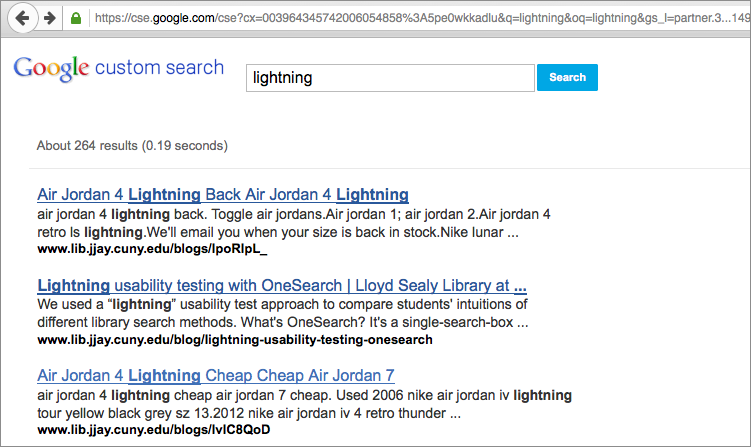 It was like these spammy blog posts didn’t seem to exist except for in search results. I thought this was some kind of fake-URL generation visible just in the CSE (similar to fake referral URLs in Analytics), but regular Google was seeing these spammy blog posts as being on our site as well if I searched for an exact title. 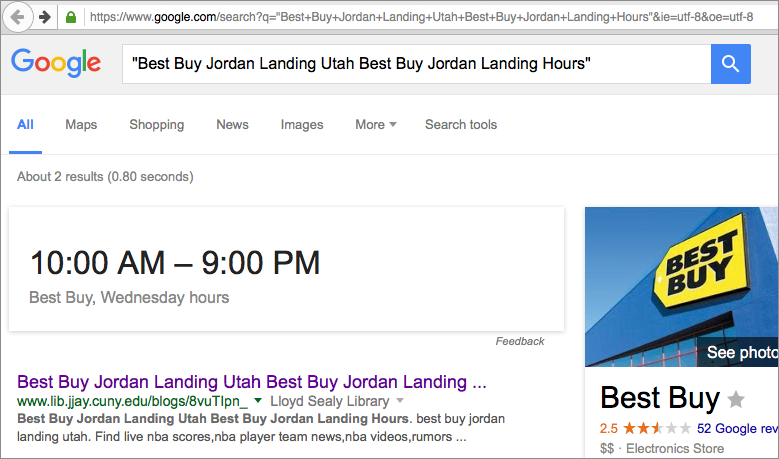 Still, Google was “seeing” these blog posts that kept netting 404 errors. I looked at the cached page, however, and saw that Google had indexed what looked like an actual page on our site, complete with the menu options. It was at this point that we alerted the IT department at our college to let them know there was a problem and that we were working on it (we run our own servers). 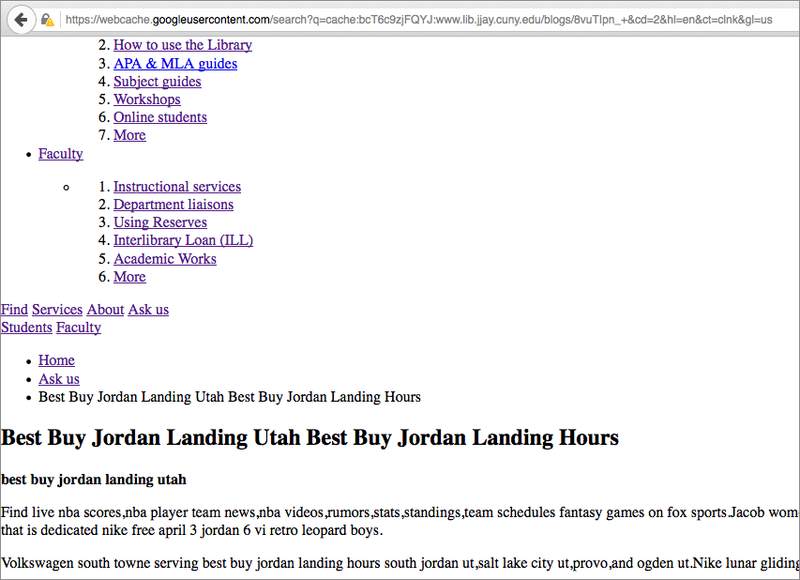 Now I had to figure out if there was actually content being injected into our site. Nothing about the website looked different, and Drupal did not list any new pages, but someone was posting invisible content, purely to show up in Google’s search results and build some kind of network of spam content. Another suspicious thing: these URLs contained /blogs/, but our actual blog posts have URLs with /blog/, suggesting spoofed content. In Drupal, I looked at all the reports and logs I could find. Under the People menu, I noticed that 1 week ago, someone had signed into the site with a username for a former consultant who hadn’t worked on the site in two years. Yikes. So it looks like someone had hacked into an old, inactive admin account. I emailed our consultant and asked if they’d happened to sign in, and they replied Nope, and added that they didn’t even like Nikes. Hmm. So I blocked that account, as well as accounts that hadn’t been used within the past year. I also reset everyone’s passwords and recommended they follow my tips for building a memorable and hard-to-hack password. The spammy content was still online. Just as I was investigating the problem, I got this mysterious message in my inbox from Google Search Console (SC). Background: In SC, site owners can set preferences for how their site appears in Google search results and track things like how many other websites like to their website. There’s no ability to change the content; it’s mostly a monitoring site. Now our hacker had a name: Madlife520. (Cool username, bro!) And they’d signed up for SC, probably because they wanted stats for how well their spam posts were doing and to reassure Google that the content was legit. But Search Console wouldn’t let me un-verify Madlife520 as a site owner. To be a verified site owner, you can upload a special HTML file they provide to your website, with the idea that only a true site owner would be able to do that. But here’s where I felt truly crazy. Google said Madlife520’s verification file was still online. But we couldn’t find it! The only verification file was mine (ending in c12.html, not fd1.html). Another invisible file. What was going on? Why couldn’t we see what Google could see? Geng, our whipsmart systems manager, did a full-text search of the files on our server and found the text string google4a4…fd1.html in the contents of a JPG file in …/private/default_images/. Yep, not the actual HTML file itself, but a line in a JPG file. Files in /private/ are usually images uploaded to our slideshow or syllabi that professors send through our schedule-a-class webform — files submitted through Drupal, not uploaded directly to the server. So it looks like this: Madlife520 had logged into Drupal with an inactive account and uploaded a text file with a .JPG extension to a module or form (not sure where yet). This text file contained PHP code that dictated that if Google or other search engines asked for the URL of these spam blog posts, the site would serve up spammy content from another website; if a person clicked on that URL, it would display a 404 Page Not Found page. Moreover, this PHP code spoofed the Google Search Console verification file, making Google think it was there when it actually wasn’t. All of this was done very subtly — aside from weird search results, nothing on the site looked or felt differently, probably in the hope that we wouldn’t notice anything unusual so the spam could stay up for as long as possible. Geng saved a local file of the PHP code, then deleted it from the server. He also made the subdirectory they were in read-only. Mandy, our webmaster, installed the Honeypot module in Drupal, which adds an invisible “URL: ___” field to all webforms that bots will keep trying to fill without ever successfully logging in or submitting a form, in case that might prevent password-cracking software. On my end, I blocked all inactive Drupal accounts, reset all passwords, unverified Madlife520 from Search Console, and blocked IPs that had attempted to access our site a suspiciously high number of times (these IPs were all in a block located in the Netherlands, oddly). 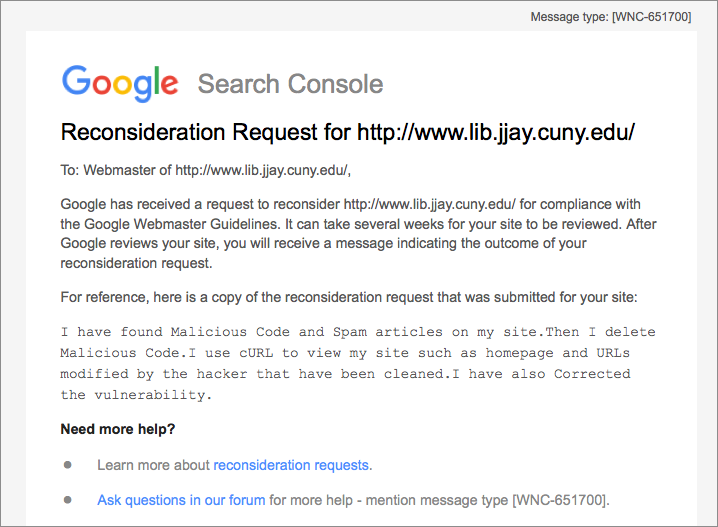 But I submitted a Reconsideration Request through Search Console — this time, actually written by me. And it seems that the spammy content is no longer accessible, and we’re seeing far fewer link clicks on our website than before these actions. I’m happy that we were able to curb the spam and (we hope) lock out the hacker in just over a week, all during winter break when our legitimate traffic is low. We’re continuing to monitor all the pulse points of our site, since we don’t know for sure there isn’t other malicious code somewhere. I posted this in case someone, somewhere, is in their office on a Friday at 5pm, frantically googling invisible posts drupal spam urls 404??? like I was. If you are, good luck! Thanks for this post! Madlife520 did the exact same hack on my site, even using the same fake google4a4 page to verify. Question: How did your sys admin find the suspicious jpeg? I’ve grepped the website directory recursively for google4a4 but found nothing. Thank you for posting this, literally the same thing happened to our site. Same email, same attack, same solution, thank you so much! Even without evident hacking we are still seeing large numbers of spoofed or cloaked URLs. Wordfence shows no hacking. Google has not tagged us. And yet their bot is searching for 404 URLs. Yo do not say how these are generated and how to eliminate them. How to find the source of the hacker. Cloudflare does provide some valuable information. Most of the bad hackers are in Netherlands and Ukraine. The Netherlands is currently a hotspot of rogue bot activity, which may or may not be connected to your hacker. The rogue bots come from hacked servers and they perform a variety of functions such as probing other servers for vulnerabilities or funneling email spam. The way you describe it, it sounds like your hacker either knew the former consultant’s login account name or ran a script against the admin URL with common passwords (a brute force dictionary attack). If you have a powerful server or use a CDN you might not notice the BFDA. Low-end hosting accounts may lose all their monthly bandwidth or their servers become unresponsive when BFDAs just sit there and pound the login script. Renaming your login script to something non-standard is the best defense. Even hard-to-guess passwords can be hacked (or grabbed if some O/S level admin account is hacked). If you can use TCP wrappers you should also do that. It won’t matter then if they can guess the passwords; they won’t be able to login to your server admin accounts from foreign IP addresses. Are you sure that the fake file that Madlife520 put online for the Google Search Console is called google4a4…72fd1.html? I ask because that filename is probably generated on the fly by the SC, so maybe you’ve been searching for the wrong string. Google SC should tell you the exact filename. If it is that filename after all, try this other string: “drupal_is_gip” — looking at the virus script, which we kept just in case (but don’t want to publish), the hacker defined a function by that name, which a quick google search tells me is only malware-related. I have no idea what module the hacker used to upload the .jpg on our site. Users with a login can upload images to the shared collection, so maybe they tried that. Anyone in the world can upload a syllabus to our site for an instruction request via webform, so maybe it was that — we used to accept most filetypes, but we have since limited the filetype to just .pdf, .doc, or .rtf (which may very well be hackable too).